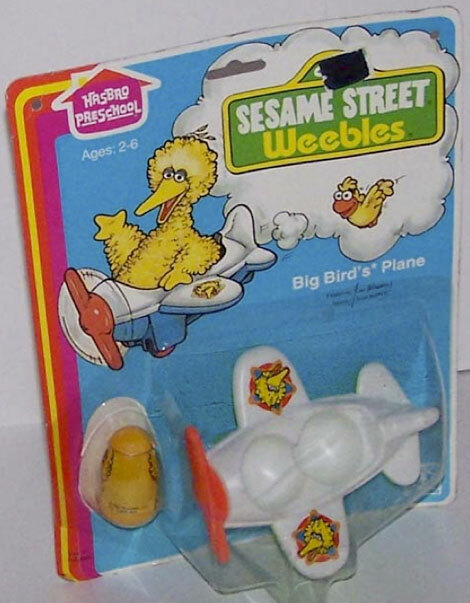 Description: Fly away with Big Bird Weeble and his plane! 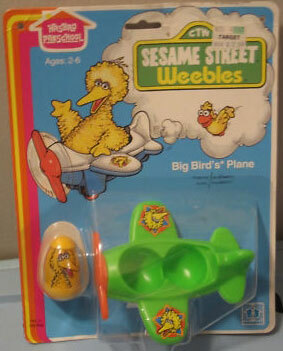 HTW383 - Big Bird - Yellow base, yellow top with Big Bird picture on both sides. Marked, "©1982 Muppets, Inc., Pat 3, 805, 444". HTW389 - Plane - Small 2-seat private plane with a green top, white bottom, orange 2-blade spinable propeller on the front, and rolls on 2 small orange wheels. Top of each plane wing has a litho of Big Bird's face. Bottom of plane is marked, "©1973 Hasbro®, MADE IN USA". HTW393 - Plane - Small 2-seat private plane with a white top, green bottom, orange 2-blade spinable propeller on the front, and rolls on 2 small orange wheels. Top of each plane wing has a litho of Big Bird's face. Bottom of plane is marked, "©1973 Hasbro®, MADE IN USA".